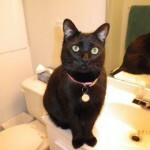 Mavis was found as a stray in Belleville trying to get inside in sub zero temperatures. She remained in Foster care with Fixed Fur Life for over a month while we tried to locate an owner. She was not microchipped, had zero identification, was not Spayed. 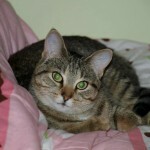 She was Spayed and Vaccinated by FFL and recently adopted. Shown here in her new home. 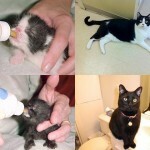 Snoopy and Hannah were left behind in an apartment at just 2 weeks old. Their owners moved a way. Brought to FFL to be bottle fed (Top Picture). 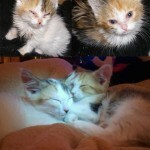 They flourished into beautiful kitties (Shown in bottom picture). 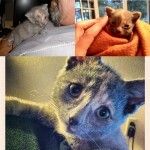 Honey Boo Boo came to FFL as a wee kitten of 4 weeks old. Found in a driveway crying she suffered from an upper respiratory infection. After many weeks of antibiotics, deworming etc she flourished. Shown in the above pictures on arrival. Shown below post adoption. 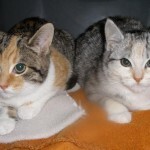 Pippy and Persia (Mother and Un Spayed female will be fixed now that kittens are weaned) have both gone on to their new homes! Sadie came to FFL at the age of 4 weeks with eyes so badly infected that one had to be removed and she was left blind in the other. (top picture). She spent many months with us gaining strength and basking in all the attention. She was adopted into a home that understood her needs. 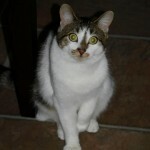 The household had one other cat adopted from FFL (Pudge) who assumed the role of guide cat. Sadie shown here playing in her new home. She lives likes she has has zero disability and her mom Barb (and sister Pudge) love her dearly. Jack was initially found up a hydro pole in the East end of Belleville. It is believed that he was chased up by a coyote which are prevalent in that area. Taken to Fixed Fur Life. 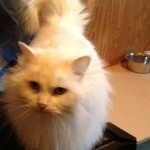 Neutered and vaccinated he has gone off to his new home today. 231 Label Kitten Alumni - This brother and sister duo were living outside a local Restaurant constantly looking or food (Top Picture). They were taken in by FFL. Spayed, Neutered and adopted. Shown in their new INDOOR home in the lower picture. For years there have been literally dozens of cats populating the Crystal Beach area. The residents there have taken care of them over the years. 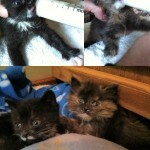 The park closed and Fixed Fur Life has one by one managed to take these guys into Foster care, fix and find homes for. Monkey found her home this week. 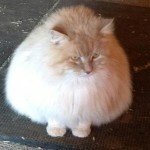 Shown above is a picture of Jack a feral cat taken in by Fixed Fur Life. The first picture is a glimpse of him living outdoors. It took many months of socialization .The picture below shows him in his adoptive home living the life of a couch potato. 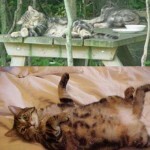 I have started putting pictures together in groups to show some of the Journeys of the cats we take in. Shown here are Oliver and Olivia. They were found hours old in a bag in a dumpster in sub zero temperatures. Found by someone taking out their garbage and brought to us. 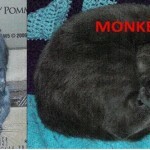 Both were adopted and Ollie presently lives on Bobbies lap at Foster Park Pet Hospital. Callie and Chloe's Journey. Shown here on arrival to FFL at 3 weeks of age emaciated, worm and flea infested and suffering from an upper Respiratory infection then later after many months of recovery with FFL in their new home. Hummer and Tubby 2 8 year old kitties whose owner could no longer look after were adopted today! Taken in by FFL and fixed and now adopted. 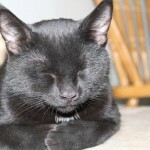 Loki recently adopted shown here in his new home! 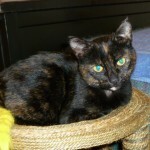 Molly was taken in as a stray. Found crying to be let inside from the cold temperatures. She remained in foster care with the woman who let her in. Was Spayed and has been adopted. Tilly and Timmy are a Mother and so duo who were trying to survive in Centennial Park in these sub zero temperatures. They have both now been fixed by FFL and have both been adopted! Barley was abandoned in the country with his siblings when his owners packed up and moved away. The farm was abandoned. Barley and siblings were adopted out. Spayed and Neutered by FFL prior to adoption. Shown here 5 years later he is doing well in his home! Angel showed up at a summer resort in Consecon and after everyone went home she was left behind with no one to care for her. Brought to Fixed Fur Life she was Spayed and adopted. That was 5 years ago. We received this update today and we are so glad to see she is doing well! This Sophie. 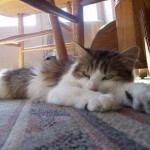 She and her sister Lily were abandoned together. From new family “They are 10 months old now and loving their new home. They have been a wonderful addition to our family. 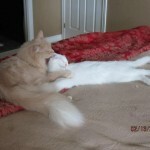 Thanks Fixed Fur Life.” Both have been Spayed. This is Lily. She was abandoned with her sister Sophie. Were both adopted. This from their new family. "They have been a wonderful addition to our family. 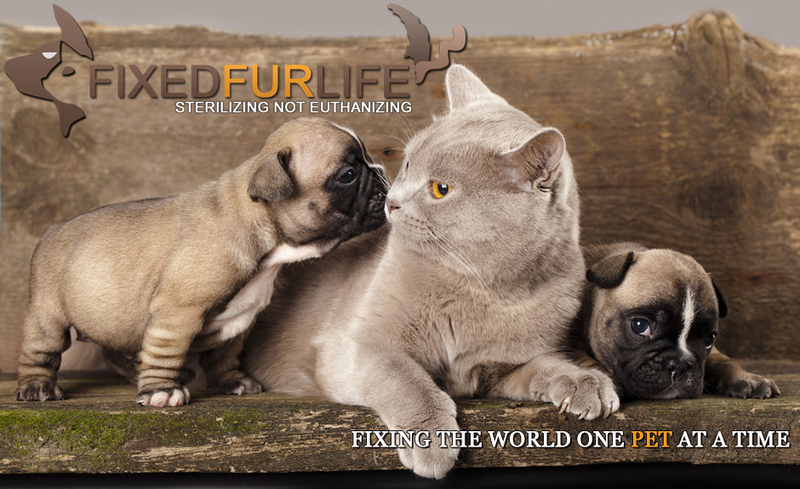 Thanks Fixed Fur Life." 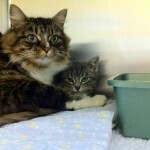 Both have been Spayed." 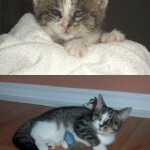 Olivia was one of 2 kittens who were thrown in a dumpster just hours old inside a plastic bag in -22 degree weather. Someone taking their garbage out thankfully heard them and brought them to FFL. They were bottle fed and both are doing well several years later. 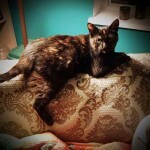 Olivia shown here living a pampered existence with her owners Paul and Pat many years after the incident. We received this update today and are happy to see she is doing so well. 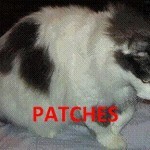 Patches was part of the Crystal Beach colony. Over 60 cats lived in the park until the park shut down and they had no where to go. All went into Foster care, were fixed and we are gradually making progress to find them homes. A few remain elusive at the park but we have volunteers continuing to round them up to go into foster care. Patches has been adopted Adopted !